Knotted wrack is perhaps the best known of all the seaweed of Northern Ireland. Because of its large size and dominance, any danger to it is a danger to the life on the shore. No threats known, but any development or change on the shore or nearby coast will endanger it. Ascophyllum nodosum is one of the most important seaweeds on the more sheltered shores. It is a large brown alga, which can grow to 2m long and live for several decades. The large egg-shaped air bladders occur in series along the frond making it easy to recognize. The frond is olive-brown in colour, somewhat compressed, thick and strap-like but without a mid-rib; it branches freely. ‘Hold-fasts’ attach it firmly to rocks and boulders. These hold-fasts simply attach the plant to the rock but unlike roots they do not in any way ‘feed’ the plant. The bladders are up to 5cm long and are not easily ‘popped’, but can be used by children to spray water or as whistles. Ascophyllum nodosum commonly bears small tufts of what appears to be a parasitic alga, Polysiphonia lanosa, which is a small red alga that can grow to about 5cm long with dense branches and although it seems to be common on Ascophyllum it is rare elsewhere and is not a true parasite. The diploid plants are dioecious and produce receptacles in which there are flask-like conceptacles containing male antheridia or female oogonia. When released, the sperm from the antheridia fertilises the eggs from the oogonia: they fuse, settle and grow to produce new plants. Fucus vesiculosus is a similar species as it also has air-bladders. However, in contrast to Ascophyllum, these are in pairs and on opposite sides of a mid-rib which runs along the centre of the flattened frond. Mature species of the genus Fucus are not as big as Ascophyllum although they can grow to nearly 1m in length. The air-bladders are much smaller than those of Ascophyllum. Ascophyllum nodosum can be found all year round on most rocky shores, especially the more sheltered sea loughs such as Strangford Lough. However, it cannot withstand the more exposed conditions of headlands or steep rocky shores. Specimens found in sandy bays will be drift specimens of little interest, usually gnarled and weather-beaten. The large brown algae on the more sheltered rocky shores grow in ‘zones’ along the shore. The species forming the top zone is Pelvetia canaliculata, lower down there is a zone of Fucus spiralis, lower still Fucus vesiculosus, near low water Fucus serratus and at very low water and below Laminaria digitata. On sheltered shores Ascophyllum grows along the middle of the shore competing with Fucus, especially F. vesiculosus. A. nodosum is one of the most common seaweeds; however it seems recruitment is poor with slow growth of germlings which may suffer from grazing. As a dominating species it is important: any changes in its distribution or density may well have important implications. It has undergone rapid decline. It is harvested in Ireland, Scotland as well as Europe and the populations may be under threat from over-exploitation or pollution in the sheltered inlets in which it thrives. Strangford Lough is designated as a Ramsar, SPA, SAC, MNR and ASSI. Report any records to CEDaR, National Museums Northern Ireland, 153 Bangor Road, Cultra, Co. Down, BT18 0EU, cedar.info [at] nmni.com. Report any coastal damage, for example, dumping, sediment removal, etc. Guiry, M.D. and Blunden, G. (eds) (1991). Seaweed Resources in Europe: Uses and Potential. Johy Wiley and Sons. Hardy, F.G. and Guiry, M.D. (2003). A Checklist and Atlas of the Seaweeds of Britain and Ireland. British Phycological Society, London. Morton, O. (1994). Marine Algae of Northern Ireland. Ulster Museum, Belfast. Morton, O. (2003). 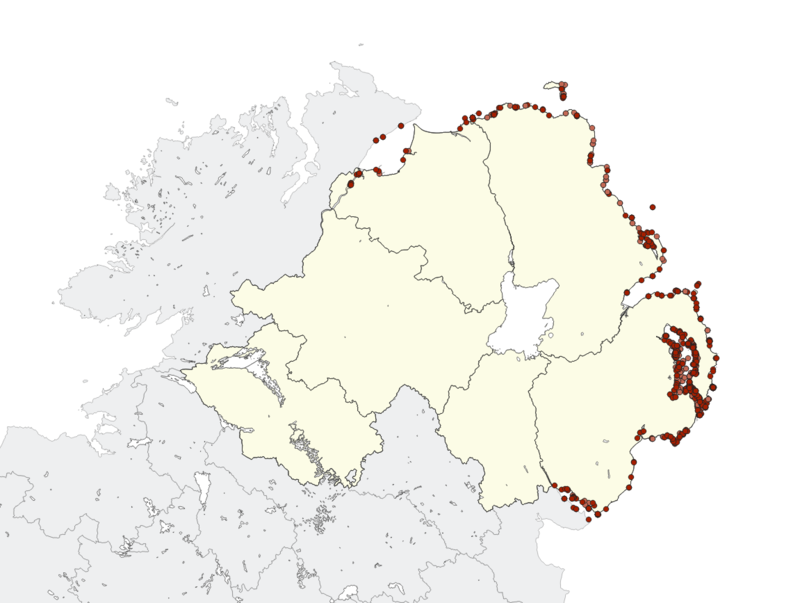 The Marine Macroalgae of County Donegal, Ireland. Bull. Irish Biogeographical Society 27: 3-164.